There are many newly digitized artifacts uploaded to the KindredSpaces website for readers of LM Montgomery. 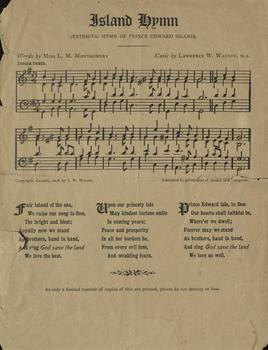 This is a copy of the "Island Hymn," which includes lyrics by LM Montgomery. Professor Harry Watts did this project because he believed that Prince Edward Island needed a song of patriotism. He invited LM Montgomery, who was not yet famous for writing Anne of Green Gables, but was known locally for her poetry, to write the verses for the song. There are very few copies of this printing from 1908 that are left today. On May 7th 2010, the Island Hymn was officially made Prince Edward Island's Provincial Anthem. Click here to see the KindredSpaces page about this document. 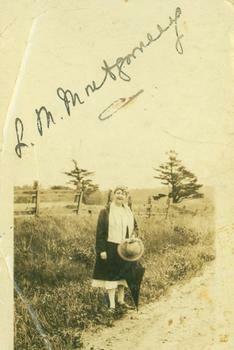 Another interesting artifact that has recently been digitized on KindredSpaces is this signed photograph of LM Montgomery and the letter that accompanied it to a fan in Australia. Dated on October 19th, 1929 the letter and photograph were sent from "The Manse, Norval, Ont." In the letter, Montgomery comments on the number of letters she had received from fans in Australia after her address had been published in a newspaper there. Regaring the photo, Montgomery asked the recipient, Clare Keever of Newcastle, Australia, to "not let it be generally seen" because the author considered most photographs of herself unflattering. To get a closer look at the photo, and to see the corresponding letter, click here. One of the most anticipated digitizations on the KindredSpaces site is the Mammoth Cave Manuscript. 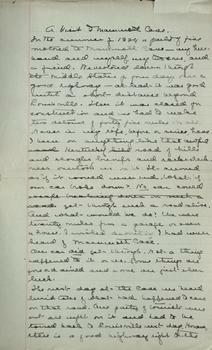 This is a handwritten account by LM Montgomery discussing her visit to Mammoth Cave, Kentucky while on a family vacation in 1924. This would later become Mammoth Cave National Park in 1941. There is no known publication of this account. Montgomery's fascination with this location can be seen through her journals and correspondence, and she often spoke about it in her public lectures. This manuscript was donated by Dr. Donna Jane Campbell on the occasion of the LM Montgomery Institute's 20th Anniversary on June 20th, 2013. To see the entire document on the KindredSpaces page, click here.